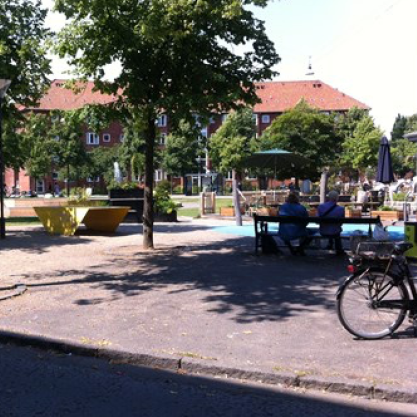 Last week we started the next stage of our research project on how you can create intergenerational urban space, by beginning our work in the two last case-areas Sydhavn and Albertslund. Both unique and intriguing in their own way: Sydhavn, the old working class neighborhood with its ‘quirky characters’ and strong sense of community. Albertslund, the most profound master planned city in all of Denmark, where soft and hard traffic is completely divided leading to an interlocked labyrinth-like network of walking and biking paths. In Albertslund we are testing out a new tool for user-involvement, one of our arki_probes. It’s a postcard with a map of the center of town where the citizens can draw their everyday routes and then return it to us by pre-stamped mail. This way we can reach a great number of people easily and get a picture of how different age groups move around the area. This gave me the possibility to enact one of my old favorite disciplines; the ethnographic study. Armed with a little black notebook, a recording device and an open curious mind I set to explore the two areas and let them unfold around me. To walk the streets and weird corners of the reality, that we have been analyzing and shaping, from the safe comfort of the office chair. Letting my feet carry me into the overgrown backyards of garden houses where senior citizens drink a cold beer in the sun, parks crawling with children, libraries filled with searching book readers, talking to whoever I met about their view on the neighborhood and the people living there. Being invited to garden parties, offered coffee, greeting dogs, given directions, shown around, told the dark side of municipal projects and an opinion or two about the government. Seeing mothers collect their kids at school, elderly sitting on a bench after shopping, drunks yelling, teenagers hanging out and grownups working. Delving into the practice of everyday life. This is an important trait of the way we work at arki_lab using a two sided approach of documenting and explaining. We can draw the citizens’ routes on maps, but we also walk in their footsteps trying to see what they see and hear what they hear.